Maximize the performance of your camera or camcorder with the SanDisk Ultra microSDHC and microSDXC Class 10 UHS-I Memory Card. Ideal for compact to mid-range point-and-shoot cameras, this versatile microSD card comes with an SD card adapter for compatibility with SD-enabled devices, such as cameras, camcorders, and laptops. Save time moving content from your card to your PC or other device with fast transfer speeds, and Class 10 supports Full HD (1080p) video capture. Today's cameras feature advanced photo and video capabilities, so you can record all of life's exciting moments. SanDisk Ultra microSDHC and microSDXC UHS-I memory cards allow you to capture, carry, and keep all those moments at your fingertips. Add storage up to 128GB to eliminate the dilemma of choosing what to keep and what to delete. With transfer speeds of up to 48MB/s, the card brings faster read speeds so you can save time transferring data. This memory card features Class 10 video rating for high-quality video recording, so you can capture Full HD without dropouts and stuttering. And with up to 128GB of storage space, the cards allow you to store plenty of Full HD video files before you have to transfer files to your computer. 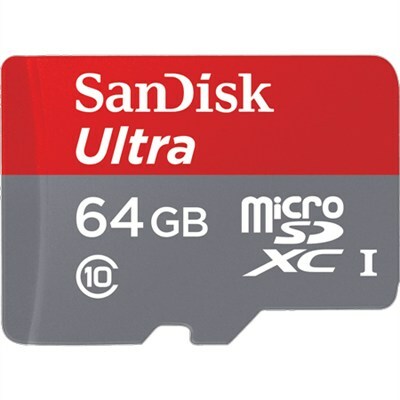 SanDisk Ultra microSDHC and microSDXC UHS-I Cards are waterproof, shockproof, x-ray proof and temperature proof5 to protect your memories from life's mishaps. Take your phone or tablet to the snow, the pool, or the desert. Your card will survive, even if your device doesn't.